For other uses, see Paralipomena (disambiguation). 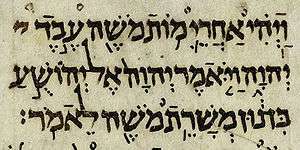 The Rest of the Words of Baruch or Paralipomena of Baruch (Ethiopian Säqoqawä Eremyas, "Paralipomena of Jeremiah") is the pseudepigraphical text that appears in the Ethiopian Orthodox Church Old Testament Biblical canon. It is not regarded as scripture by any other Christian group or by Jews. ↑ Cowley, R. W. (1974). "The Biblical Canon Of The Ethiopian Orthodox Church Today". Ostkirchliche Studien. 23: 318–323. Archived from the original on September 23, 2007. Retrieved 2009-06-30.